?Do I need a personal injury attorney to handle my truck accident claim? ?Who can be held liable if I’m hurt in a truck accident? Truck drivers often travel several thousand miles each week, but it only takes one error in judgment to cause an accident. Failure to check blind spots before changing lanes or turning can be considered negligence, leaving a truck driver and his employer financially responsible for any injuries that may result. 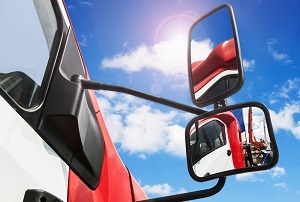 It’s a common misconception that semi trucks have fewer blind spots than passenger vehicles. Even though the truck driver is sitting higher up, his vehicle actually has several large blind spots. These are often called no-zones. Front no-zone: Since truckers sit higher up, the cab obstructs the part of the road directly in front of the vehicle. The front no-zone of a semi truck is about 10 car lengths. If you cut in front of a semi too quickly after passing, you will likely end up in the no-zone and increase your risk of being involved in an accident. Rear no-zone: Semi trucks have large blind spots directly behind the trailer. If you’re tailgating and the driver can’t see you, an accident may occur if he needs to stop suddenly. Right no-zone: A truck driver’s visibility is severely impaired on the right side. If you’re on a multi-lane highway and driving in the lane to the right of a semi, the best way to avoid accidents is to travel at least one car length behind the back of the trailer. Left no-zone: Semi trucks have a smaller blind spot to the left, extending back to about one-third of the length of the trailer. If you can’t see the truck driver’s face in his mirror, he can’t see you. Turning no-zone: Semi trucks require more space to make turns than other types of vehicles. If you’re in the angle made by the trailer swinging to the left or right, you will be in the driver’s blind spot. Truck drivers are trained to be constantly aware of their surroundings. Although their vehicles have large blind spots, the Federal Motor Carrier Safety Administration (FMCSA) requires them to take reasonable precautions to avoid an accident. For example, these precautions often include mounting two mirrors on the left and right side of the hood to reduce the size of their blind spots or using back up sensors to warn of vehicles in the no-zone. Medical expenses such as surgery, hospital stays, prescriptions, and physical therapy. Any necessary future medical care if the accident left you with a permanent disability requiring ongoing treatment. Loss of wages while you were recovering from your injuries. Loss of future earning potential if the accident left you permanently disabled. You may be found partially at fault for a no-zone accident if you were speeding, tailgating, passing improperly, or engaging in other unsafe behavior. However, Georgia law still allows you to collect damages from the accident as long as you were less than 50% at fault. If you were more than 50% at fault, you’re not entitled to any compensation. Accidents involving semi trucks and passenger cars are likely to result in serious injuries, due to the size and weight discrepancy between the vehicles. However, since claims involving truck drivers must often be processed through the trucking company’s insurance carrier, it can be quite difficult to receive timely reimbursement for your accident-related expenses. It’s best to hire a personal injury attorney to handle your case as soon as possible. Your attorney can gather all of the necessary documentation to support your case and negotiate with the insurance company to maximize your financial compensation. The experienced personal injury lawyers at Rechtman & Spevak are committed to advocating for the needs of Georgia residents who’ve been injured in accidents involving commercial motor vehicles. Please complete our online contact form or call 888-522-7798 to learn more. Who Will Be Held Liable If I’m Hurt in a Truck Accident?